Hello Paul. I am a Chinese Android developer and I have some questions about the Managed Profile Mode on L.
1) How to re-install an non-system-app to the Managed Profile when it has been installed on Primary Profile? 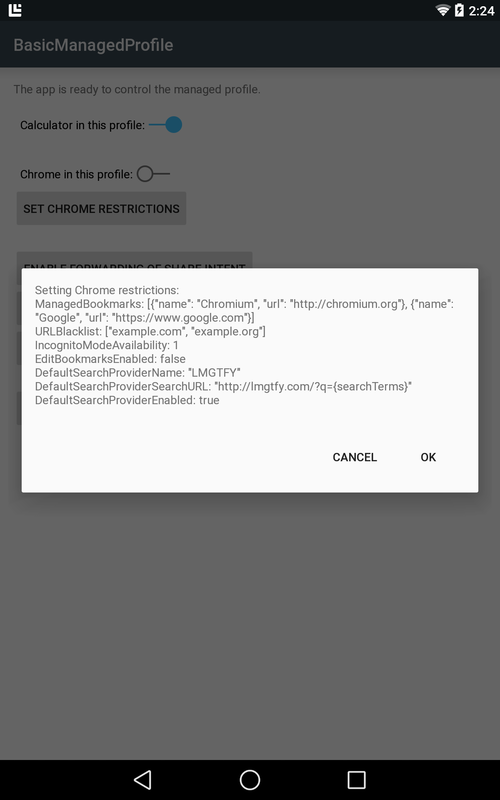 The Android Lollipop only has api to enable system apps on the Primary Profile and it can not work on others. 2) How to make broadcaster or startService intent accross between Primary Profile and Managed Profile？I can only make startActivity intent to do this succesful by use method addCrossProfileIntentFilter(). 3) How to get the information about restion bundles of system apps? And can I restrict the thrid-part-apps like systems? Hi Alex, thanks for the interest in my post. Unfortunately, in my cursory look at the Managed Profile features, I didn’t explore the finer aspects that you are asking about. However, you might check the following Stack Overflow posts which seem related to at least one of your questions: 1) http://stackoverflow.com/questions/27375736/how-to-enable-non-market-application-in-managed-profile-android-5-0-programmat; and 2) http://stackoverflow.com/questions/27311251/how-to-obtain-package-info-list-form-primary-account-when-application-in-managed. I’d also recommend that you post the remaining questions there. Good luck and sorry I haven’t been much help. Thank you for your reply, Paul. I have read the information provided by you. The second one is that I put forward.Anyway, thanks again for your suggestions . Very interesting. But how is a managed app actually bound to a user? In prelollipop I assume it was inherited from the authenticated user, hence in GUI I select correct user, enter my password and all app run as that user. In this scenario the authenticated user is always the primary user, so where does a managed app get its user from? Hope that makes sense! Hi Janet. I don’t think secondary users can have managed apps, but I would like to try it and get back to you. But my hunch right now is that managed apps are always associated with the primary user.